What an amazing crowd, there were nearly 1400+ Flex /Flash Developers had attended the Summit. There were two tracks – Track1 and Track2. The sessions under Track1 are mainly for Flex Developers who is already having some experience. 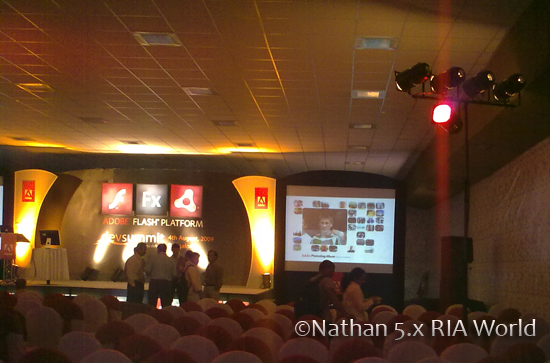 Track 2 is for designers / developers who are ready dive into Flash Platform. Since I have had little bit experience, I joined in Track1. Some of my favourite Platform Evangelists – Serge Jespers and Ben Forta came there to give Key Note and Introductory speech of Flash Platform Technologies. Ben and Serge during the Key Note Presentation. The features were shown on Flash Platform Technologies was awesome; if you would have there you could really taste the awesomeness. * Flash Platform Technologies and its road-map. * Adobe Flex 4 SDK. * Flash Builder (Next version of Flex Builder) as we are playing today. * LCDS / BlazeDS ES for J2EE Integration. * Integration of Flex App with ColdFusion / PHP. * Features of Cold Fusion 9. * Mobile Applications Development using Flash Lite. Ben Forta, Director Flash Platform Evangelism and Serge Jespers, Platform Evangelist. Serge has opened the Developer Summit with the introductory speech about Flash Platform; moving further Ben started his speech from Features and Availability of Flash Platform Technologies across multiple devices. Everyone in the Summit were thrilled and got freeze for few minutes, not because of the climate, because of the awesomeness, features and future of Flash Platform. Ben speech mostly about the business and marketing aspects of Adobe Flash Platform, since he is from Director of Evangelism team especially from Cold Fusion. Serge speech was related to the Key Features of Flash Platform Technologies which includes Flex, Flash Player and AIR. During this fun filled and thrilled session, Serge took a challenge to himself. Here are the words of Serge, “I’m going to build the Flex Application starting from the Design to Back End Connectivity within 15 minutes”, everyone in the Summit was murmured with themselves about this hard challenge 🙂 Hope the developers would know that. 😉 Finally he had finished the Challenge successfully within the fixed span of time, which shows the POWER of Flash Catalyst and Flash Builder. If you won’t agree, just give a try.. 😛 During this challenge everyone was keen to watch his activities, it was very interesting and funny ;). After this interesting Challenge, the video was shown from Adobe Flash Platform Team – it’s all about the Features of Flex and AIR Applications from Advertising Industries to Enterprise Industries. * Spark Architecture – it has advanced UI Components, this is fully based on the skin level design / development. They have introduced lots of pre-defined skinnable components. It is the cool and interesting feature to work with. * MXML 2009 – it has the new tags and namespaces in Flex 4; more tags available for Playing with Effects and Animations even with skins. Separate namespace for Spark Architecture like <s:ComponentName/>, we can also use the existing MX components along with Spark Comps. * Flex 4 Effects – This is about the new ways and tags available for doing and playing Effects and Animation (I like this very much, since it has plenty of new things to play) . It has rotation, 3D and more..
* Layout Containers – Introduction of new Layout Components namely Group, VGroup, HGroup, and many more..
* FXG – Flex Graphics Components. This is very cool, nice of defining and declaring the graphical elements. * Finally Advanced CSS having more style selectors – we can use descendant and ID selectors, and multiple style name in the styleName attribute. In general Flex 4 SDK mainly focused to avoid Designer – Developer Gap. WOW.. He is one of my favourite and frequent meets-up platform evangelists, because most of the times he used to roam around the country. His demo was started from Adobe Photoshop-to-Flash Builder to build an end-end application. He has developed the mini Twitter application in Flex 4 using Photoshop (PS), FlashCatalyst(FC) and FlashBuilder(FB). He has given a quick and simple four steps for this Application Development. ItemRenderer : Image (Profile Image), Label( Tweets) and one more label for Profile Name. This ItemRenderer was used in the DataList to show the list of Tweets and Profile Image of the Particular person (typed from the TextInput) – hope you knew this. He has completely designed this Renderer in Flash Catalyst (you can also check with duplicate data on-the fly) and switched to Flash Builder by importing the FXP file. While importing the FXP file to Flash Builder, it will create the Complete Package Structure (model/view/components) and main.mxml file for you. So there is no need to create the separate package by own, WOW.. what a feature it is ! ! Really it will help you in terms of productivity. Then he added the Twitter API inside this package and connected with real time Twitter site. Application was finished within 30 minutes. Everyone gave their applause with smile. * Build and design the New Components apart from the imported UI Layers. * Common states Effects and Transitions. * ItemRenderers creation and testing with duplicate data. * Apply the event handlers for the UI Components. * SWF / AIR file export options. * Code and Design view checking. He talked about the RPC Services in detailed. He has demonstrated the simple employee application, with the integration of MySQL database using Apache server. It shows the Powerful feature (RPC Service Panel) of Flash Builder 4. In this Employee application, he has written the code to fetch the Employee details from the MySQL database using simple configuration in the Flash Builder. Done within 5 mins of time, if you did the server side code already. It is the great and much need feature of Flash Builder. It will really help and save our developer time to connect with the server-side. He also added two lines of code to create the complete employee form (details of the particular employee). Abouth the application : It has data fields namely First Name and Last Name in the DataGrid, while selecting any item in the Grid, the respective Employee details will be fetched and displayed in the Form on the fly. We need not write any code for this form, using simple wizard with few steps we can easilt create. 😉 can’t you do on the fly ?? This wizard has full set of Configuration of Services. The interesting thing here is Automatic Paging; it saves more space in the Browser. Next interesting thing is, if any item fetched from the DB, it is stored internally, if the same item needed in future, we need not make a new service call to get that item. It will get the data from the internal storage and display it on-time. WOW.. superb feature.. It’s the power of DataCentricDevelopent (DCD) framework in Flash Builder. If you start using that you would really rejoice the freedom and awesomness of Flash Builder. * Services Panel like Properties and Navigator Panel, which will help us to integrate with backend connectivity. The back end connectivity might be J2EE , PHP , .Net , Ruby, WSDL and ColdFusion services. You can also montior the data-transfer and performance. * Auto Event handlers and getter/setters generation. * Profiler for performance and memory leakage analysis. * Live Recording of the application. He has started the discussion from comparison of LCDS (Live Cycle Data Services) and Blaze DS. Both are used for J2EE integration. BlazeDS is an OpenSource Data Management service from Adobe having optimal features compared to LCDS ES. Live Cycle Data Services – Enterprise Services (LCDS ES) 3 Beta having powerful features for the J2EE Integration. It can support AMF/AMFX encoding as well as SOAP related web services. It has improved RTMP / RTFMP Streaming facility. Theme of this session was Create -> Package – > Distribute -> Discover. How effective and easy it is !!! This session was started with N95 application demonstration; in the pipeline they have shown Flash Lite 3.1 in mobiles. Finally he has deployed some Flash Lite Applications in mobile using Adobe Mobile Packager. The output format of this Adobe Mobile Packager is .CAB file, which is capable to install the application in most of the mobile devices. Finally the Adobe Team shown some interesting features on Flash Player and its availability across the world. Everyone in the Summit were excited about this real-tim technology. Really impressed ! ! ! Within a Single day and single track I got plenty of things on Adobe Flash Platform Technologies, but this year we have two cool days. Oh my god ! ! ! It is going to be two awesome days in all the flash platform developers journey..
AFPS, 2010 will feature everything from innovations in Flash and Flex to bringing great experiences to mobile phones and devices, to the future of the Flash platform. You have the opportunity to learn new technologies that enable integrated design and develop workflows, and innovative ways to monetize content. You will go back to your home with the skills, insight, and contacts to take advantage of these opportunities as they transform our industry. Are you going to miss this great show ???? Ah ah.. If your answer is yes, you’re really going to miss the two awesome days of your life. How can you join in this great show ?? 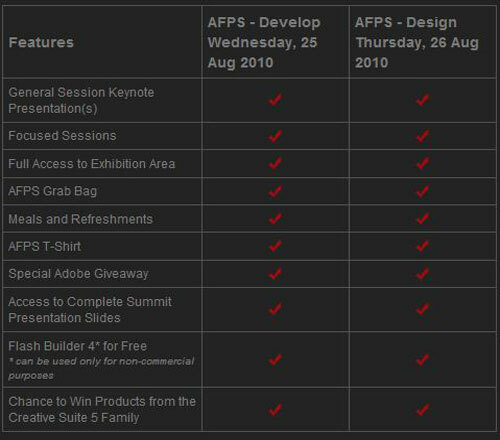 If you register, you will get the following benefits from AFPS 2010 along with the awesome technology experience. Still 54 days guys .. Register now and get early discount… Bye bye ! ! ! See you there @ NIMHANS Convention Center, on Aug 25-26. I’m also eager to attend this great show.